Many parents ask themselves what their baby should wear at night. It is important that your baby is at the right temperature when he is asleep – not too hot or too cold. Too warm is not good as the chance of SIDS is higher in babies that are too hot. 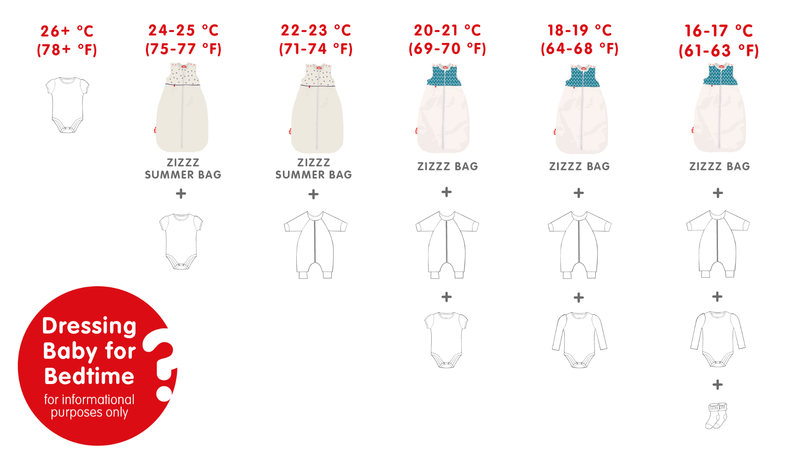 A room temperature of 17-21°C is ideal in combination with a baby sleeping bag made of natural and breathable materials such as wool and bio cotton. As temperatures vary you might put on or take off a layer such as a pyjama or a body. Off course all babies are different and the infograph on this page is just intended as a guidance. It is best to check your baby regularly to see if he is not too hot. If your baby is at the right temperature he will sleep better, and you will as well. How do I know if my baby is not too hot? You can best feel your baby’s tummy or the back of their neck. Hands and feet are not a good indicator as they can feel cold. If the skin feels hot or sweaty it might be a good idea to remove a layer. If a baby has a fever he should be very lightly dressed so that he can lower his body temperature.